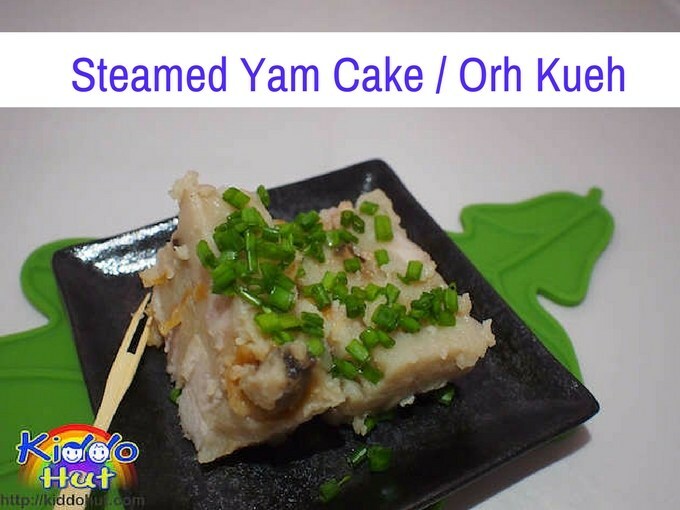 Following the Steamed Pumpkin Mushroom Cake, today I decided to cook Yam Cake / Orh Kueh (芋头糕) for both adults and toddlers at home. 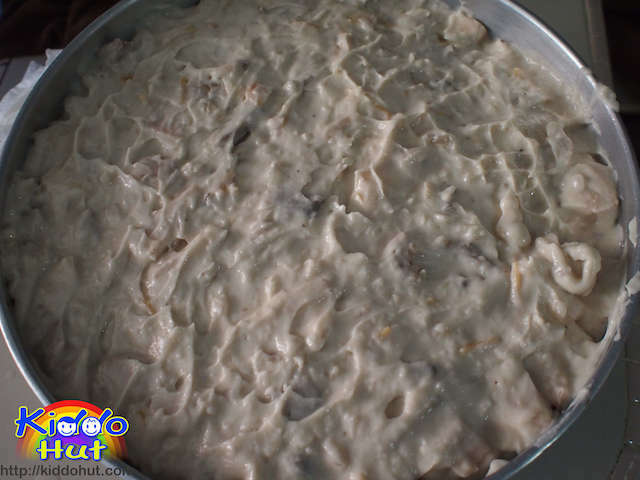 In fact, the way to cook Yam Cake and Pumpkin Cake is almost similar except the amount of water as Yam “absorbs” water whereas Pumpkin “produces” water during the process of cooking. I am using my mum’s recipe in making this Orh Kueh so you can see that there is a generous serving of all the ingredients. This is nothing compared to what you can buy from the stalls. I always need to fish for the Yam and not the mention the Chinese mushroom. This is what I like about cooking at home. As I am making this Orh Kueh for my twins tots as well, I made this as healthy as possible. Instead of dried shrimps, I used dried scallop. And, I have added chicken tights to add nutrients to the dish. Do not use chicken breast meat as it will be too dry after steaming. You can click on Steamed Yam Cake for Tots, for the recipe to make for tots. 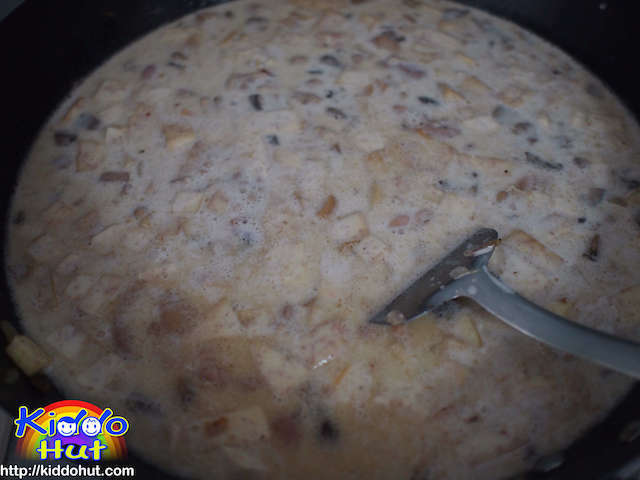 Rather than just adding water, to make a real tasty Yam Cake, you need to use soup stock. I always made my own chicken and fish soup stock for my kids. But, if you don’t have ready-made one, you can always buy the Campbell Chicken Stock without MSG. The water that is used to soak the Chinese mushrooms and dried scallops can be used too. This gives more fragrance to the Orh Kueh. Just ensure you wash them before soaking. To marinate the Chinese mushroom, I replaced sugar with Blackstrap molasses. For cooking oil, I used the virgin coconut oil. You can use mix of virgin olive oil and shallot oil. Finally, the Yam which should be fried and lightly seasoned with salt to enhance its fragrance and keep the Yam in pieces after steaming. It is recommended to use the Yam as soon as you cut them. Do not let the yam becomes brown. Last but not least, the fried shallots. Homemade is always more healthy and tasty since we do not re-use our oil many times. In case you forgot to buy shallots, like me at times, I used onions instead to stir fry with ingredients and reduced the amount of onions to 80g. Still, it tastes much better with some fried shallots sprinkled on top of the Orh kueh! Yummy! 1. 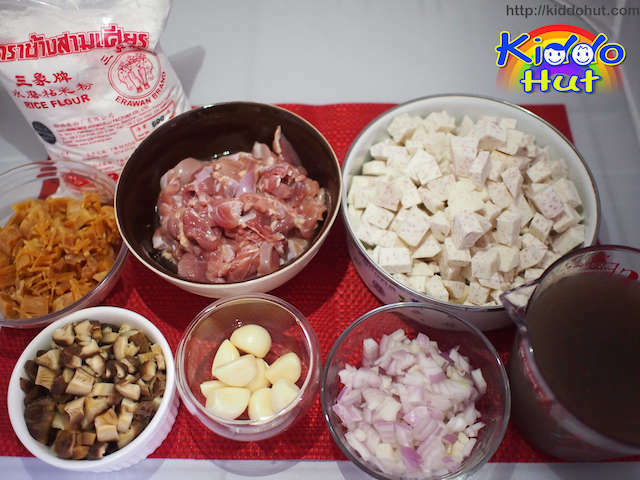 Dice the chicken tights or cut to small pieces or desired size and marinate with salt, pepper, mushroom essence and sesame oil. Set aside in fridge for at least hours. 2. Rinse and soak mushrooms for about an hour or until they are soft. Squeeze dry and use the water for mixing with flour later. Dice the mushrooms and marinate with 1/2 tsp pepper, 2 tsp sugar, 1/2 tsp salt and 2 tsp sesame oil. Set aside for an hour. 5. Peel shallots, rinse and slice thinly. 1. Add 1.5 tsp bamboo salt to flour. Stir in 1.8 litre of soup stock and water from the drained mushroom and scallop, gradually until the flour dissolves. Ensure no lumpiness. Set aside. 2. Stir fry 20g shallots over medium heat till golden brown. Off heat and remove shallots from wok. Set aside. 3. Fry yam until soft for about 3 minutes. Put in bowl and set aside. 4. Heat the wok with cooking oil. I used 5 tbsp of virgin coconut oil. Stir fry 100g shallots and garlic till fragrant. 5. Add dried scallop / shrimps and stir fry till fragrant. 6. 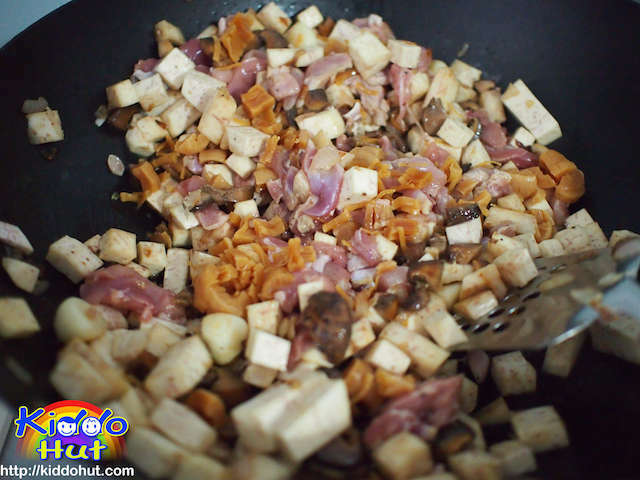 Add mushroom and stir fry till fragrant. 7. Add in chicken and stir fry for 2-3 minute. 8. Add in yam. Gradually stir in the flour mixture until it becomes sticky. Turn off the fire and continue to stir until the batter is able to coat the spatula lightly. Taste to add salt. 9. Pour the mixture into the steaming tray. And steam under high-medium heat for an hour. Insert a skewer or toothpick and if it comes out clean or almost clean means it is ready. 10. Let it cool, approximately an hour. Then cut and garnish with spring onion, fried shallot, cut red chilli, sesame seeds, coriander. Serve. You can keep the steamed yam cake in the fridge for 2-3 days in air-tight container and just re-steam it when ready to serve. 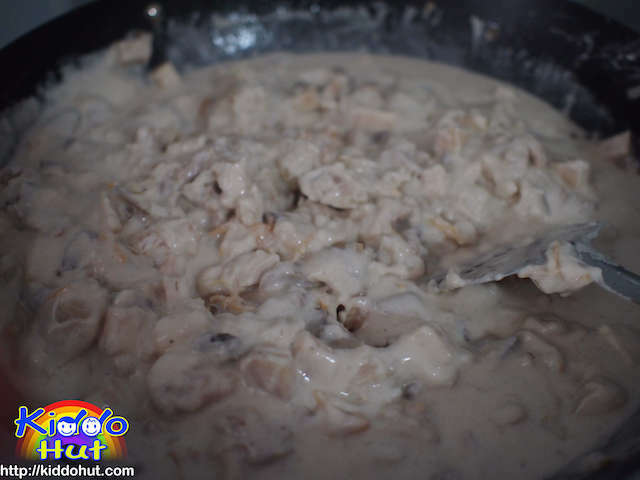 As I have added chicken in this recipe, it is preferably to serve within 1-2 days. Alternatively, you can pan-fried it, or fry it like fried carrot cake. It will be equally yummy.